Rest easy at the Econo Lodge Downtown South hotel in San Antonio, TX. 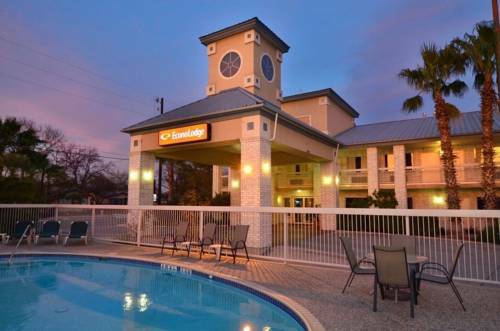 Our pet-friendly, affordable hotel is near the Alamo, SeaWorld San Antonio, San Antonio Zoo and Aquarium, Six Flags Fiesta Texas and San Antonio International Airport. Enjoy amenities like free Easy Starts hot breakfast, free WiFi, free coffee, a seasonal outdoor pool, meeting room, guest laundry, valet cleaning and copy services. Each relaxing guest room features a Flat-Screen TV, refrigerator, microwave, hair dryer, coffee maker, iron and ironing board. We support green hotel practices and our hotel is accessible to individuals with disabilities. Also, earn rewards including free nights and gift cards with our Choice Privileges Rewards program. Pet Fee 25.00 USD with 100 USD refundable deposit if no damage. Bi-Lingual Staff.